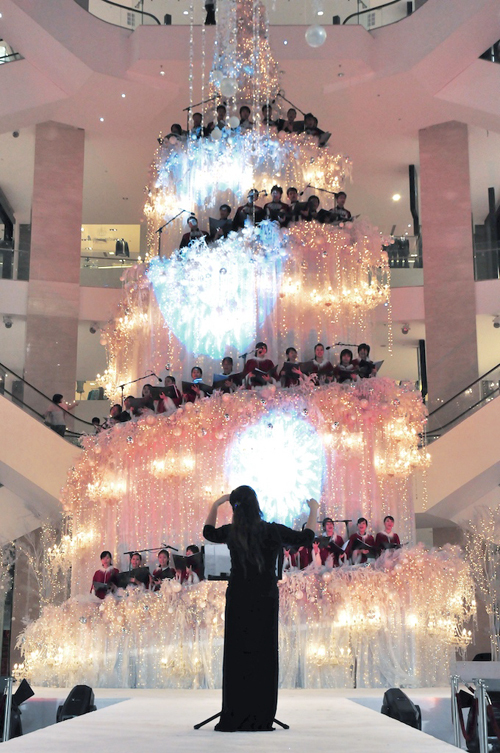 As promised, the bigger picture to yesterday's post: The Giant Singing Christmas Tree. Wishing one and all, A Joyful Christmas with friends and family. May the yuletide be gay and hopefully Jack Frost doesn't nip too close. There they were. Aaaahhhh. I'll show you the bigger picture tomorrow. It was lovely. 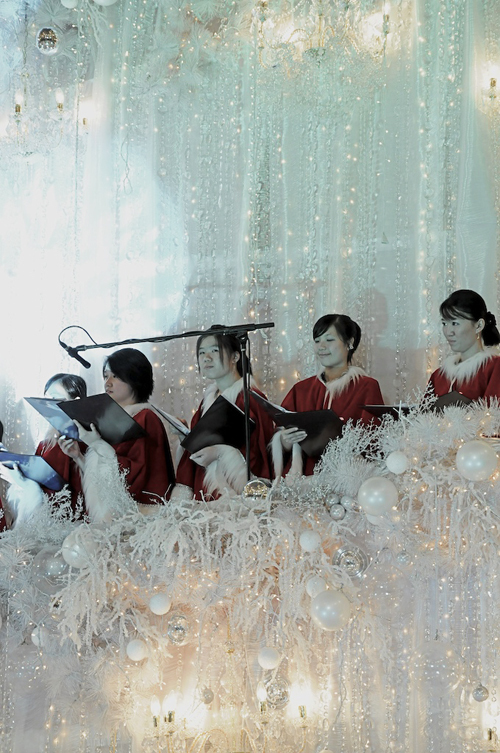 What Christmas ditty have you caught yourself singing? I'm straddling between Frosty The Snowman and O Holy Night. People look at me funny. I'm not a quiet singer. The circus is in town! I'm not sure which one but I do know it's from London. 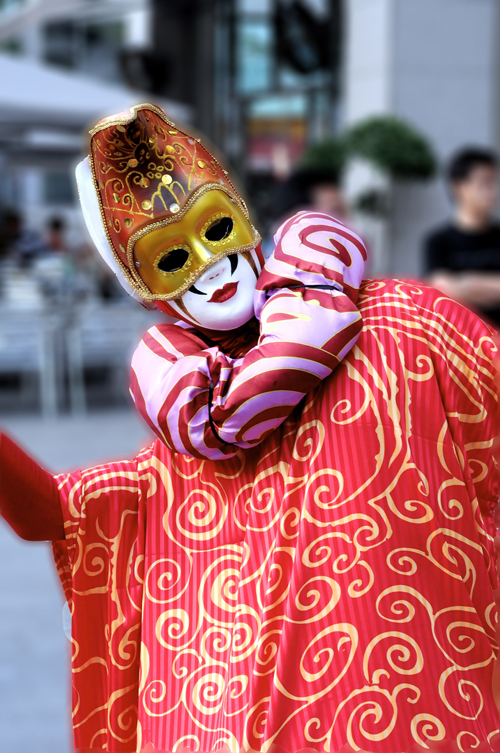 I asked this masked performer. However, he didn't squeak a sound and kept moving about attracting the passerbys. The moment I took out my camera, he stopped moving. Snapped this shot, tried asking him again, didn't get an answer, he kept on swaying and moving. How do I know the circus is from London? There were a couple of boys performing with him and so I asked them. All they could say was 'London.' The boys were not from London, they were local Chinese boys. Oh well. It's Christmas time, mistletoe and wine. Doesn't matter where this circus is from. It's given us something else to do this festive season. You know, I love the colour red and have come to realize that Christmas wouldn't be complete without it. Red presents, red baubles and beads on the tree, everything red. Strong and vibrant. 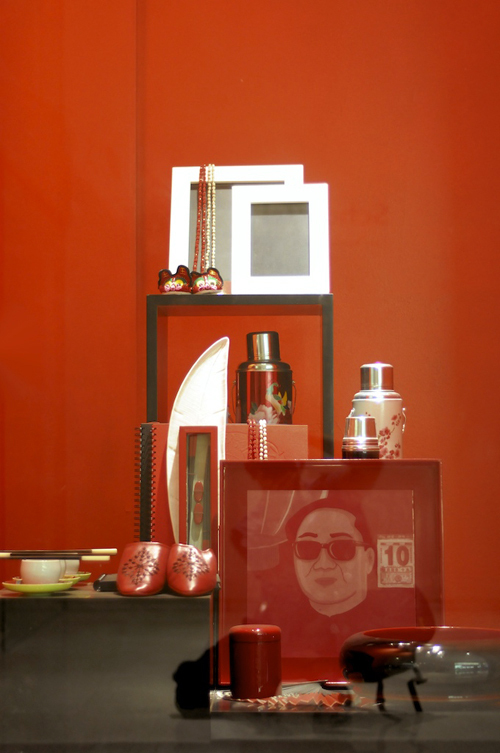 Like this window display with it's gift ideas. I saw it and snapped a shot. Completely attracted and drawn in. And what a year 2007 has been. We're just days away to saying goodbye. So much good and yet the bad headlines the papers. Personally, I've achieved enough to keep me going another few years. Socially, I want to somehow bring some peace to our shaken nation. Lack of trust, a failing judiciary and racial unrest ever more prominent in our lives. Every small movement sends a red alert to the authorities and the shields, tear-gas and acid-filled water cannons appear in the middle of the city. Innocent are harmed. I stand back and wish for love. Red is a beautiful colour. Let's not abuse it and waste it on warning signals. Hello! Here I am for theme day. The past month has been crazy but all is good. This is my contribution to our theme. The bridge that links the famous KLCC Twin Towers. The bridge is open to visitors 6 days a week (closed to the public on Monday) for a paltry sum of RM8/USD2.22/EUR1.78. Cheap and cheerful. 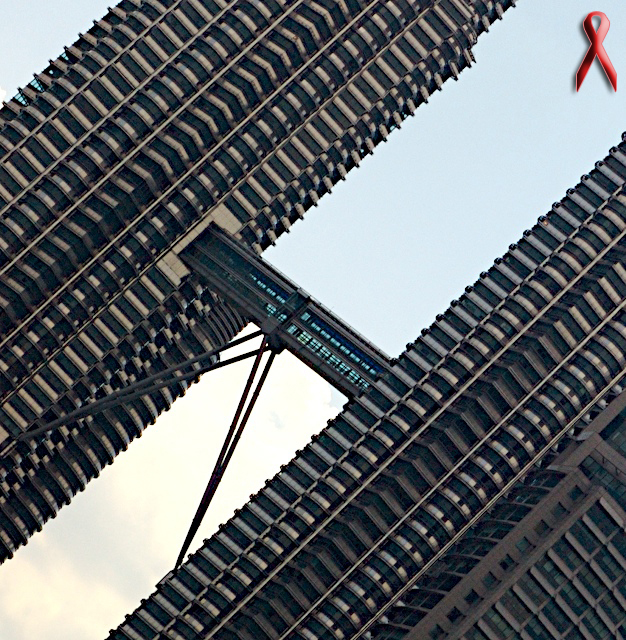 Situated on the 44th floor, you get a grand view of the towers upclose and the spectacular view of Kuala Lumpur. That is, if you come visit when the Indonesians aren't burning the Sumaterans forrests and clogging our air with the muggy haze. This is a major problem for us. I had wanted to go up and take a shot from the bridge but I kept finding myself there on Mondays. Oops. So, the next best thing, take a shot from ground level and twist the perspective. Hope you find it appealing. December 1st is World Aids Day. All I want to say is, Play Safer. We have 122 cities participating today. Go have a look at all our bridges. Have a great weekend everyone.